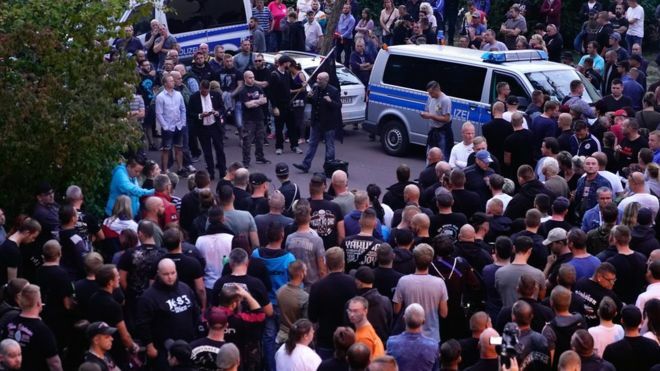 Far-right Concerned citizens and opposition anti-fascist fascist crowds have taken part in protests in Köthen in eastern Germany, where a German man earlier died following an alleged fight with Afghan men. Police were deployed to help prevent violent clashes and the city’s mayor had advised residents to stay at home. The 22-year-old fight victim was said to have died of a heart problem not directly linked to his head injuries sustained in the incident. Two Afghan suspects have been arrested. Prosecutors said that a post-mortem examination suggested the victim, who reportedly intervened in an argument involving three Afghan men and a pregnant woman, did not die directly as result of the injuries he suffered when he fell and hit his head during the fight.